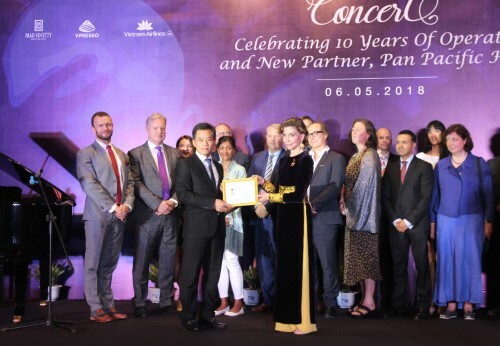 On 6 May 2018, Facing The World Appreciation Concert celebrating 10 years of operation in Vietnam has taken place in Pan Pacific Hanoi, marking a new milestone in the meaningful journey of the charity in Vietnam. The event also leveraged the partnership between Facing the World (FTW) and Hong Ngoc General Hospital. Facing the World is a United Kingdom-based charity that offers surgery for children with facial deformities in developing countries, including Vietnam. Due to the effects of Agent Orange, the occurrence of severe facial birth defects in Vietnam is by some estimates ten times higher than in neighboring countries. As a result, Vietnam is a natural choice for Facing the World’s expansion plans. Over the 10 years of operation in Vietnam, Facing the World has made significant changes in the lives of thousands of Vietnamese disfigured children, allowing them to lead a normal lives. Charity envelopes put in the guest room and charity boxes installed at strategic points in the hotel have encouraged guests’ donation of unused local currency during the concert. In addition, the hotel’s revenue from kid’s menu will be partly given to Facing The World’s fund. At the concert, the Vietnam Union of Friendship Organizations (VUFO) awarded the appreciation medal to Ms. Katrin Kandel – Facing the World CEO for her dedication in particular and the charity’s contribution in general to Vietnam over the past 10 years. 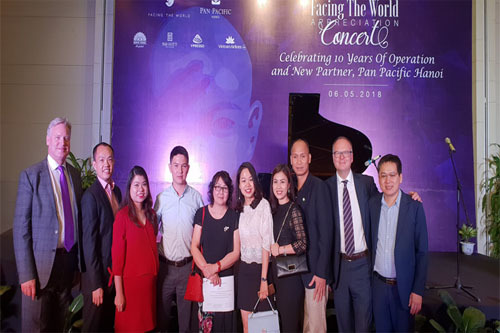 Representing for Hong Ngoc General Hospital – one of the Vietnam-based leading hospitals that have been cooperated with Facing the World to offer Vietnamese children life-changing surgery, Mr. Nguyen Ngoc Long – CEO and the hospital’s communication officers also partook in the concert. Officially collaborating with Facing the World since 2016, until now Hong Ngoc General Hospital team of doctors has worked with UK experts to operate for 37 children across the country, who have craniofacial defects. This is a great result proving the effort of Facing the World in achieving their goals in Vietnam as well as the significant contribution of Hong Ngoc General Hospital in the journey of building a better and healthier community. From 5 May to 13 May, 2018, Facing the World team of doctors are operating for 13 cases at Hong Ngoc General Hospital. So these 13 disadvantaged children would have a great chance to improve their birth defects and live a normal life like others. And their dreams would be realized soon. 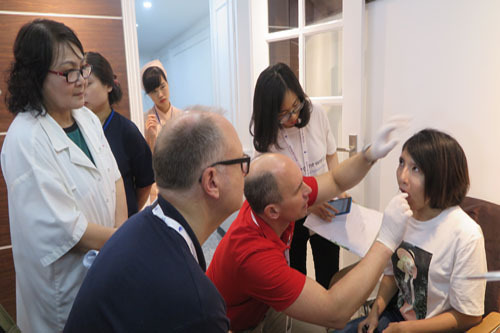 The partnership between Facing the World and prestigious hospitals in Vietnam has enable the charity to offer more and more poor disfigured children opportunity to have a brighter future. With this cooperation in general and the concert in particular, Hong Ngoc General would like other individuals and organizations to join hands, making the charity program more successful. On 25th November 2018, Hong Ngoc General Hospital completed their mission as medical sponsor of Halong Bay Heritage Marathon – one of the biggest and most professional international marathons hosted in Vietnam.